Wow, what can I say? Great weather, great people, great food, and a great time had by all. One more banquet is in the books and now it is time to get ready for the upcoming racing season. I would be remiss if I didn’t say Thank You to all who helped out by setting up or tearing down at the banquet hall as well as the following for their help in preparing for the Banquet. Larry and Sue Iacoboni as raffle prize chairpersons, Fran Russo as Ticket chairperson, Laura Tucker, Sue Ginter, and Cory Russell for selling raffle tickets, Bill Walters for picking up and organizing the trophies. Last but not least, Wild Bill Barnhart for getting the awards ordered and the program put together. Those folks took a ton of work off of my plate and did an excellent job. We are in the process of locking our Fan Club Days for 2010 and will have a tentative schedule on next month’s website update so you can begin planning your travels for the summer. If your name has been “HIGH LIGHTED IN ORANGE” on your printed newsletter then you need to renew your membership for 2010 RIGHT NOW so you don’t miss out on the benefits of being a MARFC member as you don’t want to miss out any of the great events being planned for the 2010 racing season. 2010 membership cards will be mailed out with the March newsletter and as always. If you have any questions or comments e-mail me at president@marfc.org. All of us here at MARFC extend our condolences to the family of longtime member Jim Stocker, who passed away on March 3, 2010. I was very happy and honored to have Connie Kalitta at the banquet to accept the President’s Award. I especially enjoyed talking with him during dinner and his sharing with me about all of the safety updates the NHRA is implementing to help keep the drivers safe and still put on a great show for the fans and still put on a great show for the fans. 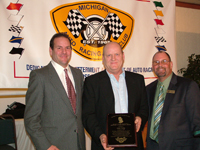 Mike Eddy was also on hand to accept the Eddie Sachs Jr. Memorial Lifetime Achievement Award. It was great to have the “Polar Bear” or the “Kawkawlin Flash” with us as well as his family and Son Travis who was celebrating his first racing championship. George Keen wasn’t able to be with us to accept the MARFC Media Award but Crystal Motor Speedway co-announcer, Trevor Hollis was there to represent George and did an excellent job of conveying George’s happiness at receiving this award. 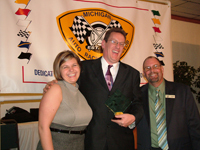 Michigan Motor Sports Hall of Fame Board Member Darcie Fuzi was on hand to present the Mick Schuler award to a very surprised and delighted Big Ed Inloes, track announcer at the Spartan and Auto City Speedway’s. 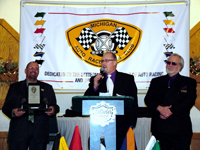 While Terry Fitzwater was unable to be in attendance this year, Wild Bill Barnhart stood in for Terry and presented the “Tom Carnegie” announcer of the year award to none other than a very humbled and excited “Shut Up” Roger Williams, the other half of the announcing team at the Crystal Motor Speedway. Appreciation awards were presented to Pat Moran, Chuck Darling, and Wild Bill Barnhart while our surprise awards were presented to Robbie Martel for Mechanic of The year in memory of Big Mike Wilhite, Michigan Traditional Sprints won our Promoter of The year in memory of Sonny Adams and the MARFC Fans of the Year were Randy & Cindy Kinne in memory of Big Jim Gullett. 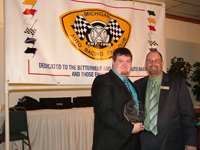 Many thanks to the Terry Bogusz Jr. racing team as well Jim’s Industrial Catering for sponsoring these special awards. Thank You goes out to Eddie Sachs, Jim Pape, Timmy Near, Jason Snelenberger, and Taylor Babcock for bringing their “Racing Rides” for display at the banquet. Also thank You to those who helped with set-up and tear down: Bob Capps, Dennis Schalm, Chuck Horan, Jeff Horan, Kyle Peltier, Al Peltier, Jeff Moroni, Laura Tucker, Sue Ginter, Steve & Cory Russell, Wild Bill, and Larry Iacoboni. MARFC sends our condolences and prayers to the Michon Family in the loss of our webmaster Rob Michon’s Mother, Barbara Michon, God speed Barbara. March 13, 2010 will see the club at the Toledo Speedway Bar & Grille for the Old Timers Meeting from noon to 6:00 PM with the MARFC monthly meeting following at 6:30 PM. The Bar is located at the Speedway and is reached from the Alexis Road exit off of I-75 (exit 210). It is the first exit in Ohio after leaving Michigan. 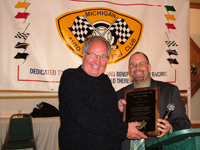 Admission to the day’s events are free with one of our guest speakers to be leading Michigan Auto Racing Historian Marty Blume. Ron Drager and Scott Schultz will be on hand to give you an update on the 2010 racing season at the Toledo and Flat Rock Speedway. Come early and enjoy the many pictures and displays as well as the great hospitality and food of the Toledo Speedway Bar & Grill.